Today is December 1st and now the countdown for Christmas starts. Like last year, I'll post a new christmas-related recipe every day. I hope you will enjoy this December celebration. 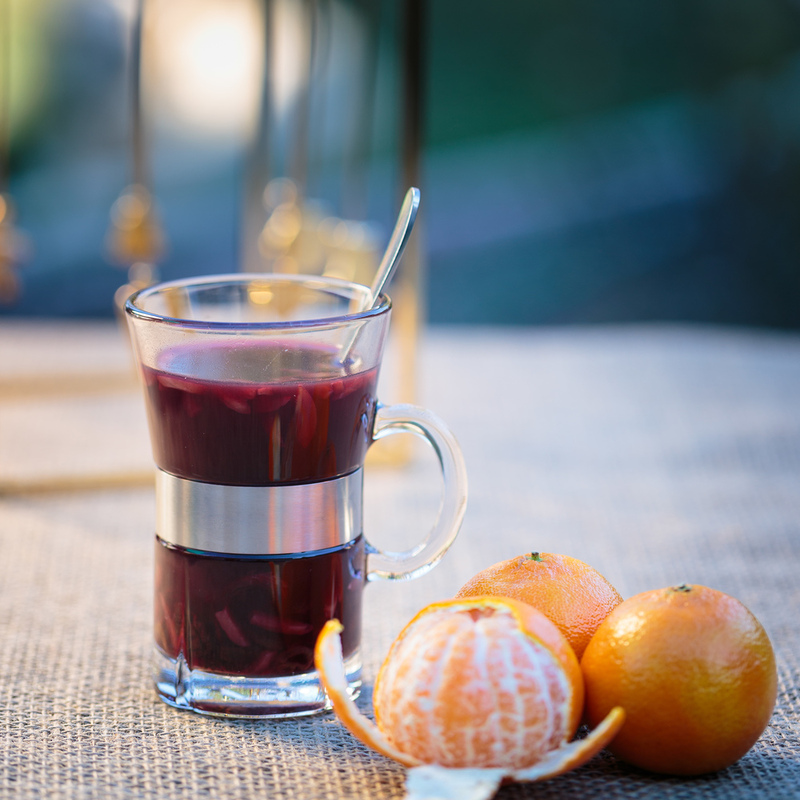 Normally mulled wine is made with red wine, but making it with white wine makes it more fruity, crisp and light. This lighter version is really nice here in the warmer climate, and will even work as an ice cold drink. Pour the syrup in to a tall glass, add whole cloves and vanillapod, cut lengthwise. Cover the glass and place it in the refrigerator overnight. Pour the syrup into a large pot, add white wine, ginger, 2 thin slices orange, a splash rum and heat it up. Be careful not to let it boil. Remove, orange slices, ginger and cloves. Add the dried fruit and the almond slivers and serve in small heatproof glasses. December 9th and time for another christmas treat. What could be good for a Monday? What about wine? Wine it is - mulled wine. Mulled wine aka gløgg is the scandinavian version of mulled wine, and has been a christmas tradition for over a hundred years. Back home with my parents we always had store bought gløgg and I loved it. I didn't know better. When we moved to California, I had to figure out to make my own gløgg extract. This is what I came up with after testing for a few years. It's a sweet spicy mix not too strong in alcohol. I hope you'll enjoy it. Put the ingredients for the extract in a saucepan, let it simmer for about 5-10 minutes. Strain the spices and zests. Add the orange juice to the extract. Soak the raisins in port wine or a stronger liquor as snaps or cognac. Heat red wine and extract to 160-176℉ (70-80℃). Add the raisins and almond slivers. Serve in a nice mug.